Are You Struggling To Find A Hamilton, Ontario Web Design Company Who Understands You & Your Business? If you’ve ever hired a Hamilton web design company in the past, you know how hard it can be to find one who’s reliable — one who is strategically focused and results-oriented. And just when you think you’ve found the right company, you soon discover that they don’t understand you and your business. And without an understanding of both your business and the goals you’re trying to achieve, the chances your project are doomed are high. Now what fun is that? Don't risk your hard earned money hiring a generic web design company. What if you hired a strategic web design company with over 15 years of experience, who were not only trustworthy and reliable, but know that your next web design project needs to be more than just technical code — it more importantly needs to excel at reaching your business goals? That the money you’re planning on spending shouldn’t be treated as an expense, but rather an investment? That you're more interested in growing your business and getting a return on your investment? What if this company took the time to learn about your business, got to the root of why you’re looking for a web design company in the first place, and applied their knowledge of the web to solve this problem? What if you could hire a company that was interested in partnering with you for the long term and seeing your business grow? My name is Liam Whittle, and I’m a strategically focused web designer and marketer. But I’m also a business owner and the founder of ShiftIdeas — a Hamilton, Ontario based strategic web design company. This company and its reputation was built on trust, hard work, and results. I want to learn about you, your company, and what you want your business of the future to look like. Together, we’ll build a plan of action that realizes that future. Now doesn’t that sound exciting? When I left my old employer to start my own business, I knew I needed a brand and website to help get me consistent customers. 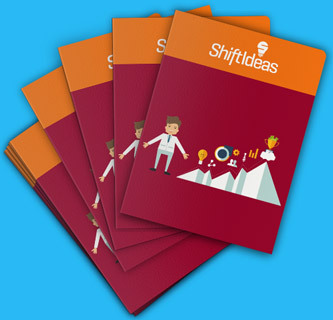 ShiftIdeas did everything from my logo, business cards, numerous signs and stationery pieces, and most importantly my website. The website constantly gets me phone calls and emails from prospective customers each month. It has been such a driving force to my company’s growth. I’m glad I invested in it. Our clients have zero hesitation referring other companies to us because our track record speaks for itself. We help each company we work with leverage the web to grow their business. Period. From your end, not really. We’ve got our process down to a science to keep things moving freely with no wasted time. This allows you to spend your time doing what you do best; focusing on your business. Well for starters, we know that what you really want isn’t a new website. No, what you really want is more leads, more customers, and ultimately more profit. Each project starts out exactly the same way — by listening. We want to learn everything we can about your business and the problems you’re facing. Only then will we be able to help you put together a strategic plan to conquer these problems and make you more money by growing your business. We're not interested in having former clients. We’re in this to build meaningful, long term relationships with every company who does business with us. This means being more than just a company that does web design but rather a company that builds powerful marketing assets that set you up for success for years to come. If you just want a web design company who you’ll give requirements to, we won't work well together. We’re experts when it comes to building and marketing websites — we know what works and what doesn’t. With trust from both sides and through our combined expertise, we want to partner with you to help build the best possible solution. If you need to look over our shoulders at all times, we’re not for you. We already work closely with our clients and communicate efficiently. We don’t need to be poked or prodded, which does nothing but slow us down. If you’re expecting miracles to happen overnight, you’re going to be disappointed. While we are capable of hitting tight deadlines, success takes time. We achieve the results we do because we take the time to invest in doing it the right way, setting you up for long term success. If you’re just looking for the cheapest possible solution, you won’t like our rates. But if you want to make an investment in your business, and want to work with a results-oriented web design company who’s aware that you need to recoup your investment and then some, let’s talk. The first step when we start your project is for us to dive in and learn your business. This is where everything and anything relevant to the success of your project gets put on the table. There might be some difficult questions to answer, but for the best results, no holding back! Next up are the goals for your project: In a perfect world, how do you envision the future of your business looking like? What defines success? What would you consider a grand slam? Once your goals are clearly defined, together we'll create a plan of action to get us there. Working within whatever budget or time constraints you have, we’ll make sure you get the maximum return for each dollar you invest in this project. Finally, we’ll get to work moving us toward the end goal. You’ll consistently be kept up to date regarding the progress on your project and how things are moving along. Having some in person meetings along the way help us see if there is a quicker and/or better path to get us to your goal. We’re currently accepting new clients, and would love to see if there's a mutual fit. Simply fill out the form above, and we'll schedule a time where we can discuss your business and how we can help make it better.